Living Next Door To Alice was written by Nicky Chinn and Mike Chapman. The song was originally released in 1972 by an Australian vocal harmony trio called New World , charting at 35 on the Australian charts. The cover by British band Smokie was released in 1976, and became a world-wide hit. Music: Key of A Major in 4/4 time at 126 bpm. Chords: A, D, E, E7 - ideal song for beginners (very easy chords). She said "I sup-pose you've heard__ A-bout Al-ice". She said, "I know how to help__  Get o-ver  Al-ice". You know I've been wait-in' twen-ty four years". Original Line-up: Chris Norman (lead vocals, rhythm guitar), Alan Silson (lead guitar, vocals), Terry Uttley (bass, vocals), Ron Kelly (drums). 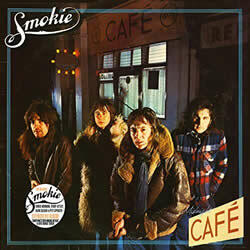 SMOKIE chords and lyrics are property and copyright of their owners. "Living Next Door To Alice" chords and lyrics are provided for educational purposes and personal use only.